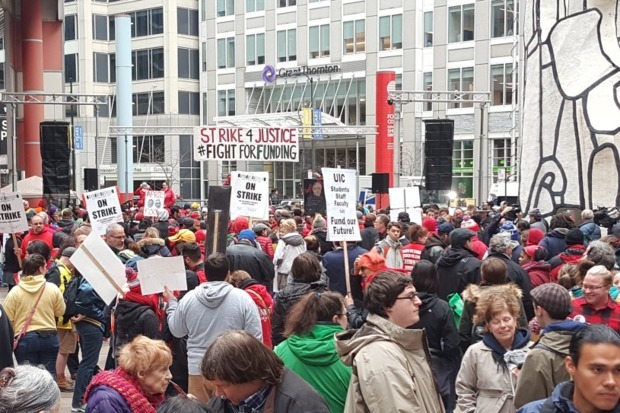 CHICAGO — After spending the morning picketing near neighborhood schools and strategic rallying spots Friday, thousands of striking teachers and their allies packed the Thompson Center plaza for an afternoon rally and rush-hour march. "Oh my goodness," said Chicago Teachers Union President Karen Lewis in looking out over a crowd of thousands. "How the world has changed. "There are too many people for me to count," she added. Lewis chided Gov. Bruce Rauner, whose Chicago office is in the Thompson Center, saying, "The governor of this state has decided to hold everybody hostage." She called Rauner "a terrorist," adding, "Rauner can't stop us, and Rauner's not stopping any of us." Reporter Ted Cox on the latest on the CPS and CTU tensions. The Chicago Teachers Union's "day of action" ended with one large protest Downtown, followed by a march up Clark Street and circling back down Michigan Avenue as teachers and other groups rallied for proper school funding and an end to what the union has called unfair labor practices at the hands of the city. The day's protests included not just teachers but educators and students at Chicago State University and Northeastern Illinois University, hit hard by a funding cutoff as part of the ongoing state budget impasse, health-care workers likewise facing a dearth of state funds and Fight for $15 fast-food workers pushing for an increase in the minimum wage, among others. An elected school board was also a popular protest cause. "Somebody has got to lead the way," Lewis said. "It happened to fall to CTU. "This is what happens when we all decide to come together and stop fighting each other and know who our real enemies are," she added. Around 3:30 p.m., the crowd of protesters near Thompson Center, 100 W. Randolph St., began to swell, eventually comprising thousands. A stage was set up in the area and security was tight as large crowds continued to pour in. State troopers blocked doors from the CTA station into the Thompson Center, and also taped off revolving doors in the building's main entrance. Yet Lewis pointedly threw bouquets to the Chicago Police Department. "I tell you what," she said. "The cops are not our enemies. ... They have been helpful." That sentiment wasn't shared by all speakers. Page May of Assata's Daughters, a group that helped defeat Cook County State's Attorney Anita Alvarez in last month's Democratic primary, roused the crowd by quoting a certain N.W.A. rap song about the police saying: "F-- the police, f-- CPD, and f-- anybody who rolls with them." Charles Preston, a Chicago State student and member of the Black Youth Project 100, declared, "This is the beginning of revolutionary change," and led the crowd in the chant of slain Chicago Black Panther leader Fred Hampton: "I am a revolutionary." Yet the mood of the speakers and the crowd was perhaps best captured by former Dyett High School hunger striker Irene Robinson. "This is true love right here," she told the crowd. "Look at us. Ain't no stopping us now." Yet she soon made her point by adding, "Rahm Emanuel and Bruce Rauner, get your greedy hands off our children." Daniel Smith, a special-education teacher, said the lack of a budget has hurt moral at his school. "It's not about the money," he said outside the Thompson Center on Friday. "I've seen positions eliminated and supplies eliminated. We have to stand for what's right. They have to respect us for what we do. We're preparing these kids to make them well-rounded citizens." 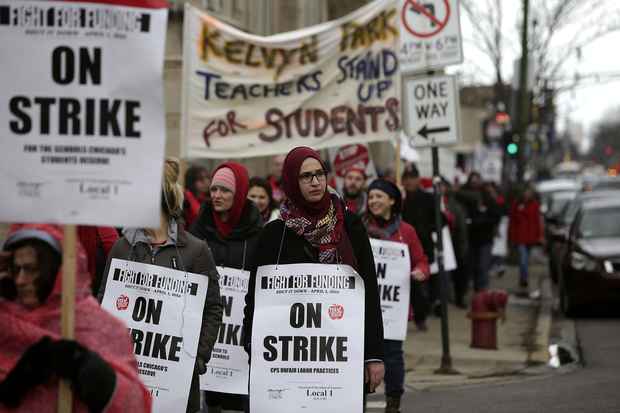 The teachers union called the one-day strike over the lack of funding for Chicago Public Schools brought on by a lack of a state budget that has caused financial strains for school districts and universities. Teachers are also furious over the state of negotiations with CPS, which has made teachers take three unpaid furlough days and has considered making union members pay an extra 7 percent toward their pensions. Teachers were joined Downtown by a number of other groups, including college professors and University of Illinois at Chicago students, some of whom rallied on the Blue Line on the way to the Thompson Center. Black Lives Matter activists, fast-food workers and Hispanic groups have joined in on the day of action with teachers and holding their own rallies to fight for an end to what they call racist police practices. Activists also are supporting a higher minimum wage and other causes. 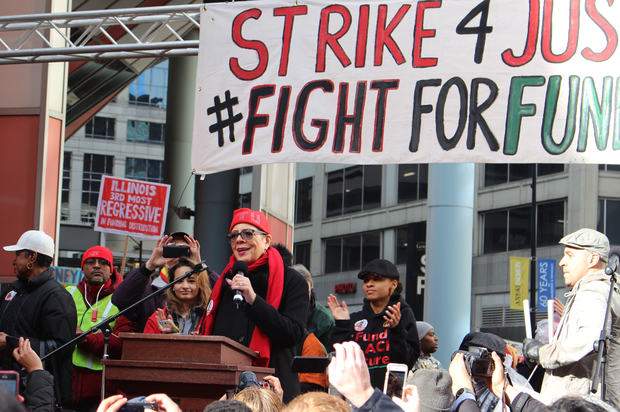 Chicago Teachers Union President Karen Lewis declares that Gov. Bruce Rauner "can&apos;t stop us" at the Thompson Center rally.